STEAWARD Steaward Vol 2 vinyl at Juno Records. 1. Ka One & St-Sene - "Aseed 2"
2. Ortella - "Dope Noise"
1. Steaward - "Track 1"
2. 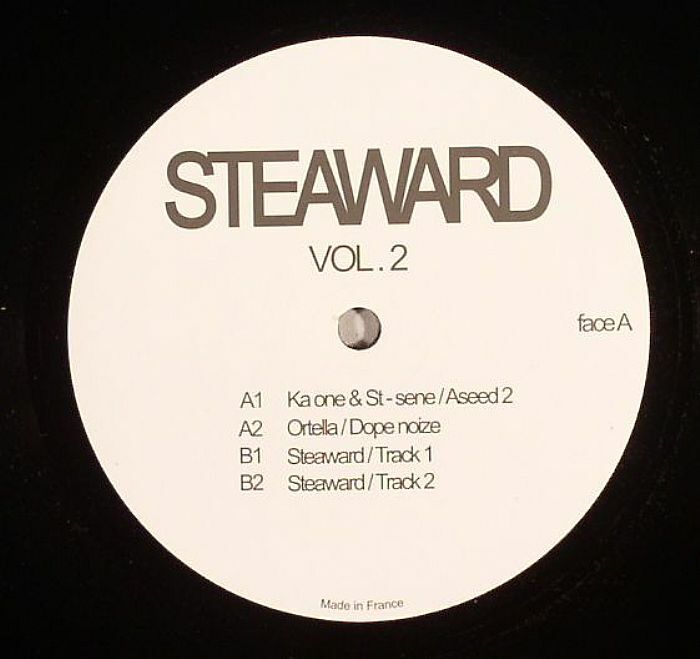 Steaward - "Track 2"
Here, one-time Local Talk and Qualmoto Records regular DJ Steaw dons his Steaward alias for a second selection of acid-flecked deep house and Detroit techno jams. This time, he's joined by a couple of other producers, who contribute impressive cuts to the A-side. There's a fluid feel to the twittering synths and late night atmospherics of Ortella's "Dope Noise", which belies the track's pumping techno rhythms. Ka-One 7 St-Sene's "Aceed Two" is similarly enjoyable, with rough 303 lines riding pounding drums and hazy chords. Steaw takes a more straightforward deep house route on his two contributions, with the sweaty and decidedly fuzzy "Track 2" outgunning the more cultured "Track 1" in the "best track" stakes.